I thought this would be an appropriate subject for the beginning of the new year. This is always a time of reflection on where we've been and where we want to go. I think it is great to look at the past and respect how it has delivered you to where you are now. It is more important to not dwell in the past, but to move ahead and live in the present. Your past may be dragging you down and getting in the way of you manifesting your dreams. You may be holding onto the pain of a lover who left you or the humiliation of losing your job or the scars from a less-than-ideal childhood. These events hurt, but they happened in the past. Keeping the past alive - whether in the form of old hurts, outdated ideas, or useless habits - makes it difficult to be open to new relationships and opportunities in the present. Try this meditation if you feel stuck in a painful past and want let go of old emotional and mental baggage. Write down those things that happened long ago that still cause pain when you think about them. 1) Stretch out on the carpet or a mat on the floor. Cover yourself with a light blanket if you need to. Breathe deeply and relax for a few minutes. 2) Bring to mind any emotional baggage from the past. If you still feel pangs of strong negative emotion when thinking of it, it is time to let go. Visualize your emotions as an old, beat up suitcase you drag around wherever you go. These old feelings no longer serve you. 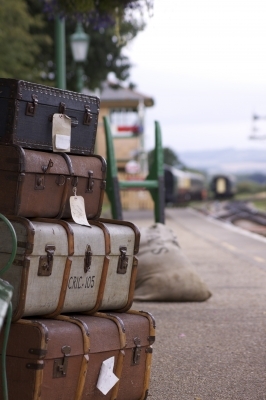 Imagine letting go of the suitcase and your old pain and what it might feel like to not be dragged down by it. See if you can sense a weight being lifted. Notice if you feel lighter. 3) Continue scanning your memory for old baggage - old, worn-out emotions and ideas that no longer offer you a healthy benefit. Again, visualize them as old pieces of luggage with broken handles and being held together with tape. Acknowledge and thank them for their presence; let them know it is time for you to let them go. Visualize yourself walking away from them or having water sweep them away. 4) Visualize and feel yourself as lighter, unencumbered and free. Breathe deeply and relax a few more minutes. See your future opening before you, full of wonder, promise, and opportunity. Our past sometimes seems so inseparable from our present. Our past served it's purpose to shape us and to provide us lessons to learn and grow from. That is why it is important to respect the past and even thank it for bringing us to our present. And then...let go. Good luck! I'd love to hear your experience with it.